If you would like to listen to a Free Audiobook version of this story, please email me at: MasterAnthonyStevens@gmail.com and I will provide you with a link to the MP3. Only a slight breeze ruffled the warm waters of the lagoon as the galleon swung free, seaweed and barnacles crusting her anchor chain, broken mizzen still waiting to be repaired. She had been too long in port. Alone in his cabin, her Master whispered harshly, “Damn that brat and his crew!” His first mate had just left after giving the summary of damages from their latest battle and it would be a long while before she was totally seaworthy again. He was a tall, ruggedly handsome gentleman of breeding, or so he saw himself. The fact that his taste for the wilder side of life had cost his family so dearly in his teen years that his father had insisted on getting him apprenticed as a seaman and finally a ship of his own, meant little to him. His exploits from St. Augustine to Barbados, had gained him a loyal, if disreputable crew and when they pillaged that jungle village with its ancient temples on the coast of Mexico, they thought the ton of gold would have made them happy. They hadn’t counted on the cursed golden dust being more than just a rich metal. And the wild man they had shot as he tried to get away, was their last mistake. He picked up his brass telescope and rested it on the frame of the open window. Carefully scanning the upper jungle, behind the village, he could barely make out the tree-nest outlines that were home to the children of the forest. The sun slowly drifted down as the moon rose and he watched and waited. Peter was off doing what most satyrs did so well, chasing a nubile female. The fact the English Wendy-wench was a human and probably wouldn’t stay more than a couple nights made her all the more exotic and desirable. That meant Tinker had to find something else to amuse herself. A bored pixie is no fun at all. The rest of the crew were either playing stupid games or bedding down with their own pixies for the night, so she decided to see what sort of mischief she might witness in the village. Peeling the thin pelt from her shoulders, she hung it on a branch and, walking softly as a dancer, moved out into the moonlight. The radiant energy from Mistress Moon made the pixie dust covering her petite frame glisten and sparkle. She glanced around for a totem creature for the evening and immediately saw a huge and lovely moth fluttering between the shadows. “That’s it. Mister Moth is a form I’ve not used in a while.” She smiled, focused her thoughts on the form of the moth and the pixie dust sparkled to a brilliant, although cool, flash of light. In the time it took the flare to die down, she was wearing the moth’s beautiful wings and was only five inches tall. She sailed high above the trees, riding moonbeams. A quickly fading contrail of dust reflected the pale light as she passed. A long, slow glide let her slip unnoticed, into the one of the three side streets leading to the waterfront quays. Each public house had a sign in front with a fish oil torch on either side that gave off greasy smoke and barely enough light to see just what den of iniquity you were about to stumble into. She hung back, in the shadows above the door, hidden by the glare from a torch. As most moths, she felt the draw of the flickering flame, but her faery personality could easily control it. She smiled. The old man had shared drinks with her before and had even been a bit of fun to tumble. He was wise in the ways of the fae and didn’t try to trick or capture her. Saying nothing, she flittered quickly down to his shoulder, kissed him on the cheek and hid behind a fold of his floppy hat. Once inside, he paused to scan the room for strangers. There were none. Good. He picked his way between the bar and some tables and found a snug booth in the back. With this assurance, Tinker flittered down to the seat in the space between him and the wall and shook herself to rearrange her dust. With just the slightest glow this time, so as not to attract attention, she was wearing her normal body… that of a beautiful faery. Smiling, he slipped off his woolen sweater and handed it to her. She slipped it over her head and this helped her to appear human enough for first glance in the dimness of the booth. “My thanks as usual, master Swan… and it would please me greatly to buy our refreshments this evening.” She waved her hand and the air over the table sparkled with pixie dust for a few seconds, then the dust coalesced and there was a clink as a single. Golden coin rattled to a stop on the hardwood. “We’re in the mood for a meal, a couple of tankards of your best as well as a bed and bath this night. We need to loosen the kinks a bit, if ya knows what I mean, lass.” With that, he hands her the golden coin. The barmaid’s eyes sparkle to match the coin, so she hurries off to make their stay a most pleasant one. None of this escaped the sharp eye of the short, balding fellow in rude sailor’s garb. He quickly tossed down the last of his ale and hurried out in the evening shadows, heading towards the docks. “Wait a minute!” She thought… “What birds?” Only silence lay outside the window that normally gave view to a lovely courtyard full of parakeets and other tropical songbirds. She turned toward the door, just as heavy steps sounded in the hallway. Her fisherman was wide awake now, as well. She kissed him quickly on the cheek, shook some pixie dust loose from her hair and in a flickering instant, was only a five inches tall, with beautiful moth wings. The window was wide open, so she flew quickly up and out… directly into a well-thrown net! She was stunned only for an instant at their audacity. 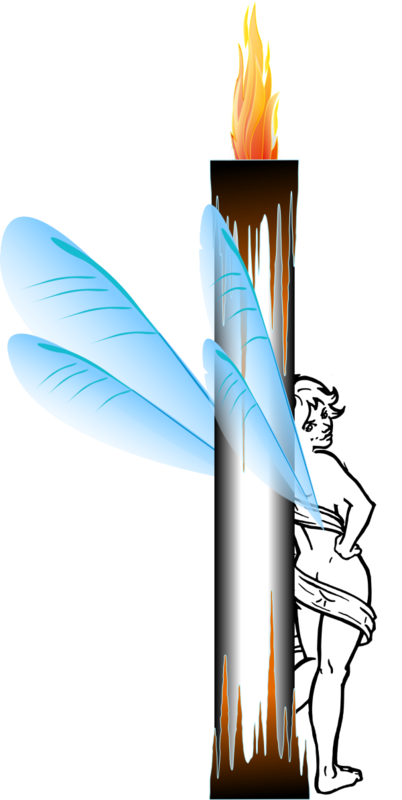 “You can’t hold a pixie with a cloth net.” She thought… Then she realized the horrible truth. They had woven bits of iron wire into each knot. Cold iron was poison to any of the fae races and she was no exception. She screamed at the freezing touch and tried to shrink within, to escape deeper into the cloth depths, below the layers of metal. In seconds, she was shaken free of the net and into an antique iron birdcage. Each brush of the metal was cold agony and she squealed several times while fluttering about. There was only one safe place to stand… a wooden plate had been attached to the center of the cage and a large, fat candle was in the center of it. There was barely room for her to lean up against the candle and keep both feet on the edge of the wood. Terrified and gasping, she clung to the candle as the laughing pirates carried her cage back to the ship. Laughter from several crew members followed this comment. “Let me out of here!” Her tiny moth wings fluttered helplessly against the sides of the candle behind her. There was no room to fly and only the rough wooden plate at her feet kept her from the chilling poison of the cold iron surrounding her. He waved his mate and the other crew members out, locked the cabin door and sat down. Her cage was sitting on his table and he leaned closer so he could speak softly. “That’s ok, m’dear. It will take a couple of days and by then, you’ll be well hidden.” He smiled wickedly and left. The rest of the day, she balanced on the edge of the plate, getting tired with no room to sit or lay. She watched the deepening red rays of the setting sun in dismay as another wave of weariness washed over her. Every time she started to relax, she would stumble and a foot would drop to the iron floor of the cage. The sudden chill of metal against her foot was painful and she would jump back against the candle and the safe, warm wood. He came in and once more locked the door behind. “Ah yes, it is a bit dark in here now, isn’t it, lass?” He struck a quick match and she ducked and winced at the sudden glare. “Hold still now, wouldn’t want to singe anything now, would we?” She watched in horror as he lit the candle. Wincing as she felt the chill of the steel hook brushing her belly, she inched back against the candle, just as the first few rivulets of molten wax flowed down, over her wings and pinned them back as it quickly cooled. She knew then, that her fate that night, was to be part of the candle, held safe from the iron cage and yet helplessly pinned in the hardening wax. “Ahoy there… Hooke!” Peter’s voice hailed from the crow’s nest. She wanted to scream her relief, but the wax had totally coated her and only her pixie magic had kept her eyes and nostrils free. Barely able to breath and affixed to the candle with many layers of wax, Tinker could only wait for Peter to rescue her. “Aye, cap’n!” His mate and the other seaman ran to wake the rest and get things battened down for the journey. Still frozen in the wax, Tinkerbelle watched in horror as her cage was carried from the dark cabin to the bow of the ship. She had heard everything and realized Peter was as good as his word when she saw him and the Lost Boys flittering back toward the tree house. The chilling horror of his iron hook gently peeled the wax from her face and shoulders. She gasped and took deep breaths for the first time in many hours. She knew he would do it, so she nodded and bowed her head in defeat. A few moments later, she was free of the wax and standing naked, on the deck. A crew man grabbed each arm and held her still while the captain wrapped a leather-lined steel cuff on each wrist and each ankle. Slender chains led from each. The leather kept her skin from touching the poisonous metal, but she would never be able to free her self. Four sailors stepped back, each holding one of her chains. With only a little bit of movement allowed, she realized what he was asking. Embarrassed and ashamed of her lewd display, she shook herself and willed a cloud of the magic dust. Sparkling, it floated off her, as her breasts and hips undulated in the bright morning’s light. She glanced around and saw each of the sailors as well as the captain were grinning. Evidence of their lust was easily visible in their stretched pants. A cheer went up from the crew as the four sailors handed the chains under the bowsprit and pulled her over the side. She screamed once as they stretched her cruelly under the sprit, bowing her back against the keel and her arms and legs spread wide along the bow. A spontaneous cheer arouse as they recognized the outline of the mountain behind their old homeport. It was almost dawn and the hundreds of new lights on the hillside, above the harbor let them know that many years had passed and much had changed. “Ship ahoy, starboard beam!” The lookout cried. “It’s a craft of the devil for sure, Sir!” His mate was, at times, a devout man… between drafts of rum, that is. A puff of smoke from the bow of the fast approaching craft interrupted him. It was followed by a tall spray of water from just in front of their bow. Another shot over their bow, this one splashing Tinkerbelle as she screamed and struggled in her chains. The captain started to snarl his refusal, then paused and realized his old friend was only speaking the truth. They were no longer part of this world and had only one chance to live. He looked over his shoulder and saw the other ship was less than a hundred yards away. Another shell splashed warm seawater on them both. Cursing under his breath, he pulled the pins from her shackles and swung her by her hair and an arm, up, over the rail. She shook herself like a wet terrier and golden dust, mixed with water flew over the deck. At once, the ship was engulfed in a thick fog, obscuring the sun and hiding it from the other craft. The ancient vessel shuddered and, trailing streams of water, left the swells behind. She climbed fast and high as she raced away from the rising sun, chasing the western stars back to Neverland.